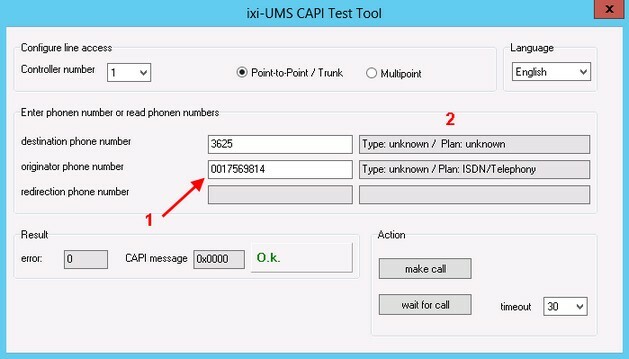 A small "CAPI-TestTool" is started in order to check the functionality of the connection. Check the general function and determine the numbers transmitted from the telephone system to ixi-UMS Business by means of an outgoing and an incoming (voice) call. 2.Select the type of connection between ixi-UMS Business and the PBX. 3.Optionally, you can specify a valid (sender) originator phone number. This should be displayed later on your mobile phone as sender. The call must now be signaled on the mobile phone. If you have specified a sender number, it should be included in the displayed caller number. Accept the call. The moment you receive the call, the connection is interrupted. 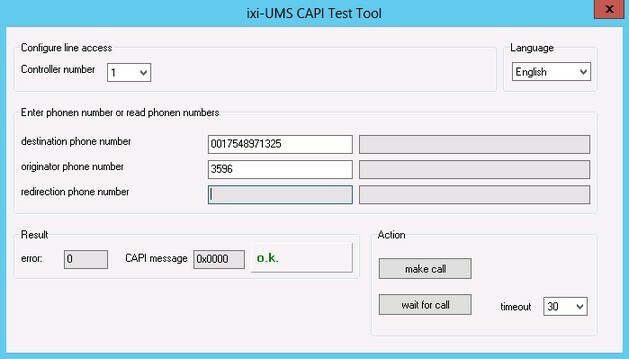 If both tests are successful, select the "wait for call"button (if necessary change the timeout) and call from your mobile phone and then from the internal telephone to a dial-in number defined for ixi-UMS Business. The call is automatically "accepted" and immediately terminated. In the "originator phone number" field, you can see how the sender numbers are transferred from the telephone system. If a leading 0 is present, this must be removed in the basic configuration - Phone number format by ixi-UMS Business. The "Destination Number" field shows what the telephone system has transferred as a "recipient" number to ixi-UMS Business. In the field after the displayed numbers (2) the Type-of-Number and Numbering-PlanP signaled by the telephone system are displayed . Please see also the articel Types of ISDN Accesses under Additional Informations in the ixi-UMS Business Server Manuals. If one of the tests is unsuccessful, <% PRODUKTNAME%> can not be successfully activated. Check the connection parameters and settings in the Bintec elmeg device. The setup can still be continued until the end. To determine the data required for a "shared voice mailbox number", please refer to "Additional Information - Route by Redirection"